He's back! Mystic Mac. The Notorious. 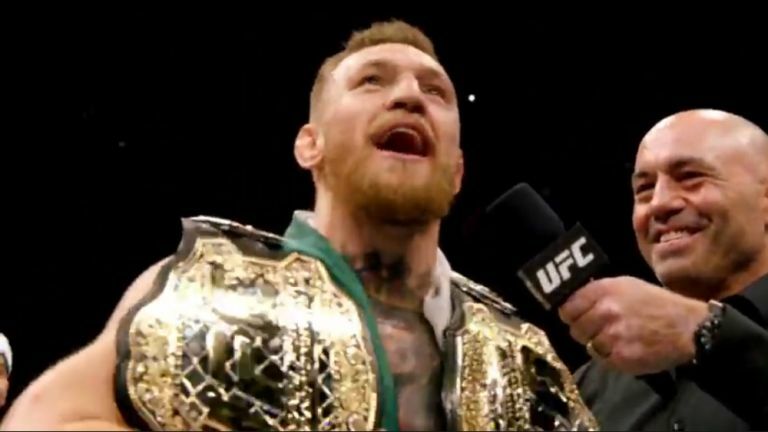 Conor McGregor is returning to the UFC Octagon for the first time in almost two years, and we have the information on how to live stream McGregor vs Khabib at UFC 229 from absolutely anywhere and as safely as possible. So why has everybody got in such a fervour about this month's UFC pay-per-view? To be quite honest, it's all about that man McGregor. After two years away (and a little fight against some guy called Mayweather), the world's most famous MMA fighter returns to the organisation where he made his name to fight Russian Khabib Nurmagomedov at the T-Mobile Arena in Las Vegas. If Sin City is the location, then the build-up to UFC 229 has been appropriately rambunctious. A war of words, the usual pushing and shoving and the Irish swagger we've come to associate with Mr McGregor. But if his fans are expecting a walkover tonight, a word of warning... Khabib is undefeated in 21 fights. A lightweight known for his unrelenting wrestling style, he'll know just what making the Conor McGregor submit would do for his standing in the sport. Over near the West Coast of the US and with a 7pm local start time, it's going to be a late night or early morning if you want to watch the main event at UFC 229 – it's looking likely for a 3am start on Sunday. You'll need to supply the coffee, but T3 will tell you the best and safest way to live stream McGregor vs Khabib regardless of where you are. If the country where you are either isn't showing the fight or you want to catch the UK PPV coverage on BT Sport, then there's still a way to get hold of a live stream. The trick is to download and install a VPN, which then allows you to change your IP address so you appear to be in a completely different location. BT Sport has proved a happy home for UFC in recent times, but it looks like UFC 229 will be the last huge super event it will host before the ever growing Eleven Sports grabs the rights. BT Sport 2 is the channel you need to tune to and, if you don't already have access to it, you can add BT Sport to your Sky package (£27.99 per month, or £12 if you have BT Broadband) or to your BT Broadband (free for three months then £9 a month). If you don't have BT Sport and don't want to commit to the options above, then you're only other legal option is to try and get it on PPV from another country after downloading and installing a VPN as described above to get around any geo-blocking. If you do this, it's worth knowing that grabbing a PPV on UFC TV costs different amounts in different countries - so it's significantly less in the Philippines (equivalent to around $17 USD) than in the US ($65), for example. That said, you would presumably have to put up with non-English commentary and presentation. Where else has a McGregor fight live stream? In addition to UFC TV, there are plenty of cable providers also providing PPV coverage of the McGregor fight. Among the most popular are Fox Sports, DirectTV, at&t and Dish. But you're looking at $64.95 whichever way you purchase, so the choice is yours. If you're away from the continent this weekend but still want to jump on one of those PPV live streams for UFC 229, then be sure to use a VPN to watch it all as if you were back home. Now this is definitely worth knowing if you're Down Under. The appropriately named Main Event service is the place to head for a cut price slice of PPV at $54.95. That's less than you'll pay on UFC TV, which is more than $70. What a lovely, violent way to spend your Sunday lunchtime. Sky Arena (Sky TV NZ's PPV station) is showing UFC 229 for $34.95, with coverage of McGregor vs Khabib due to kick off at around 3pm on Sunday.